Added Traditional Chinese localization (Wei Hung/洪偉). Update of German localization (Markus Raab). Update of Russian localization (thanks to Dmitry Valkov). Cards can be optionally sorted into groups. Groups are identified by their name which is filled in the card properties dialog. Groups are stacked vertically and sorted alphabetically. Cards within the group are ordered by their title. This ordering is just a hint for the card positioning engine which tries to reorder the cards to make them use less space. Cards can be created from another card by one click. Use icon content_copy in card header. This functionality can be used to prepare card templates. 2018-09-15: Custom tables can be marked to be visible to all players. 2018-08-11: print Print Game action added. 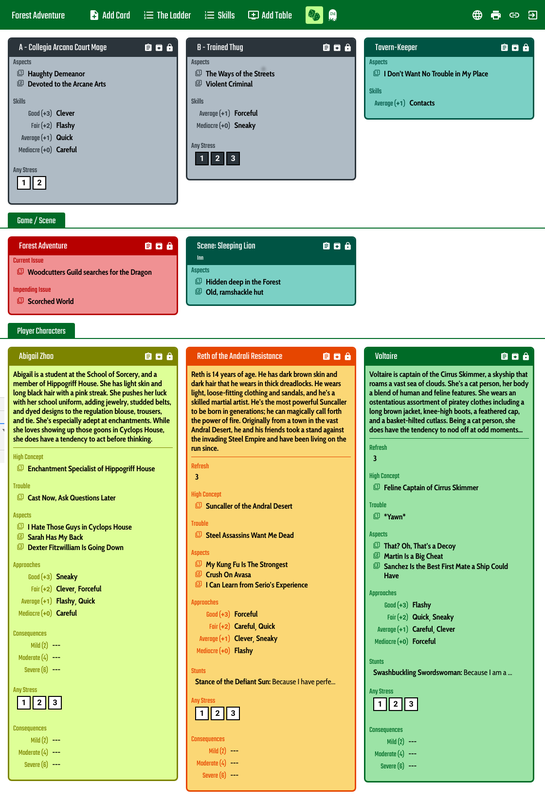 2018-08-05: Czech localization of the Basic Concepts page. 2018-07-18: Fixed blank screen after opening the game caused by update to the newer PHP by my hosting service. 2018-06-21: Localization of the whole UI. Now in English, Czech and Russian. 2018-06-21: Russian presets for Ladder and Skills (thanks to Dmitry Minchenkov). 2018-06-21: Added customizable skill list with presets for Fate Core, Fate Accelerated and d20. 2017-09-15: Fixed: Tokens cannot be moved to other place in Firefox.